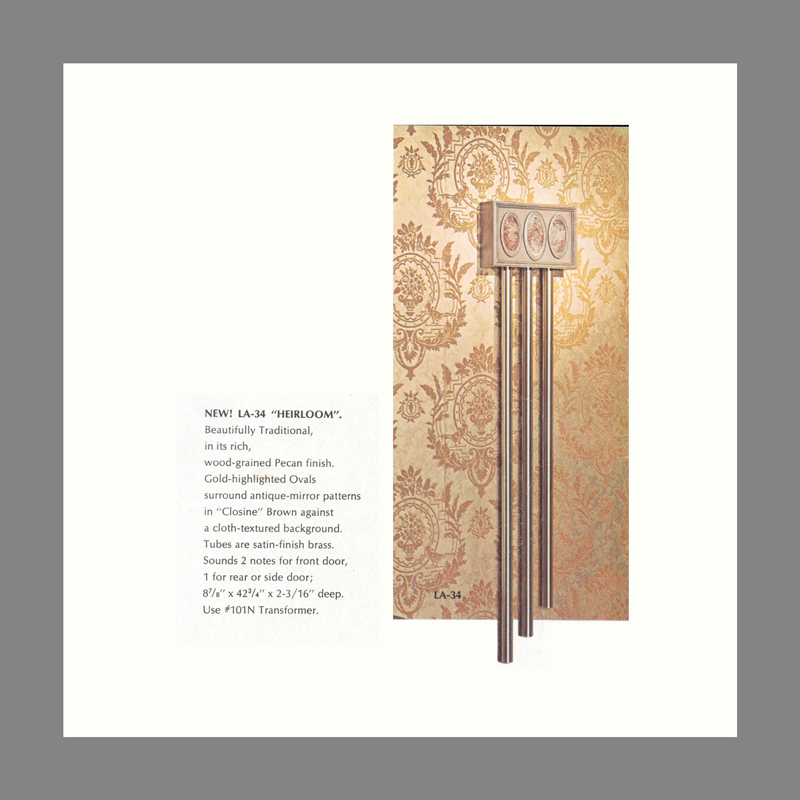 Nineteen-Seventies home decor brought earth-tone appliances, bright, wet-look bean bag chairs and this French Provincial styled NuTone “Heirloom” Door Chime. 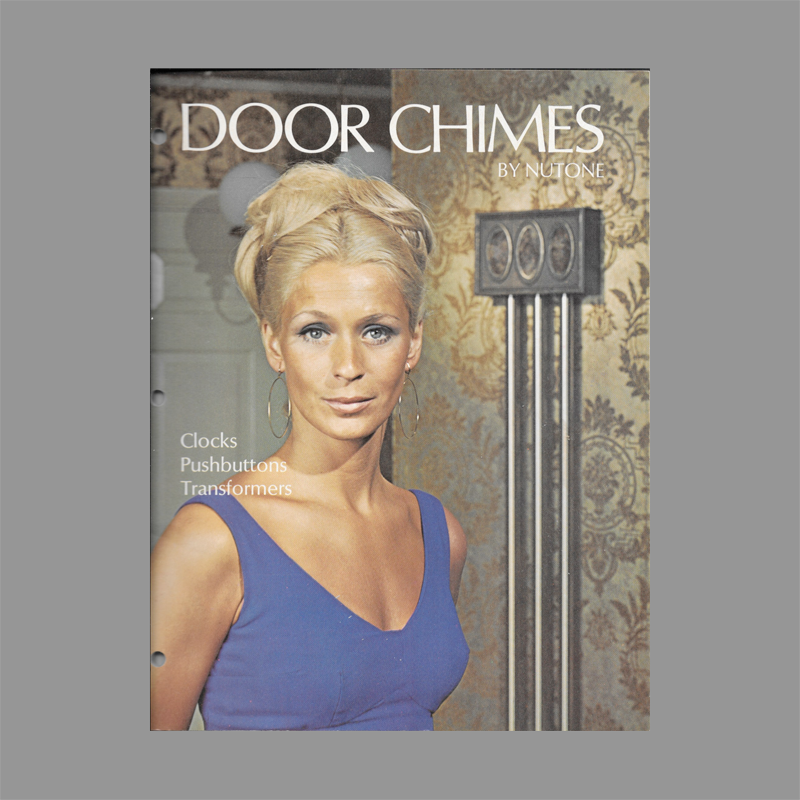 This popular model became NuTone’s flagship door chime when introduced in 1970. New! LA-34 “Heirloom” Beautifully Traditional, in it’s rich, wood-grained Pecan finish. 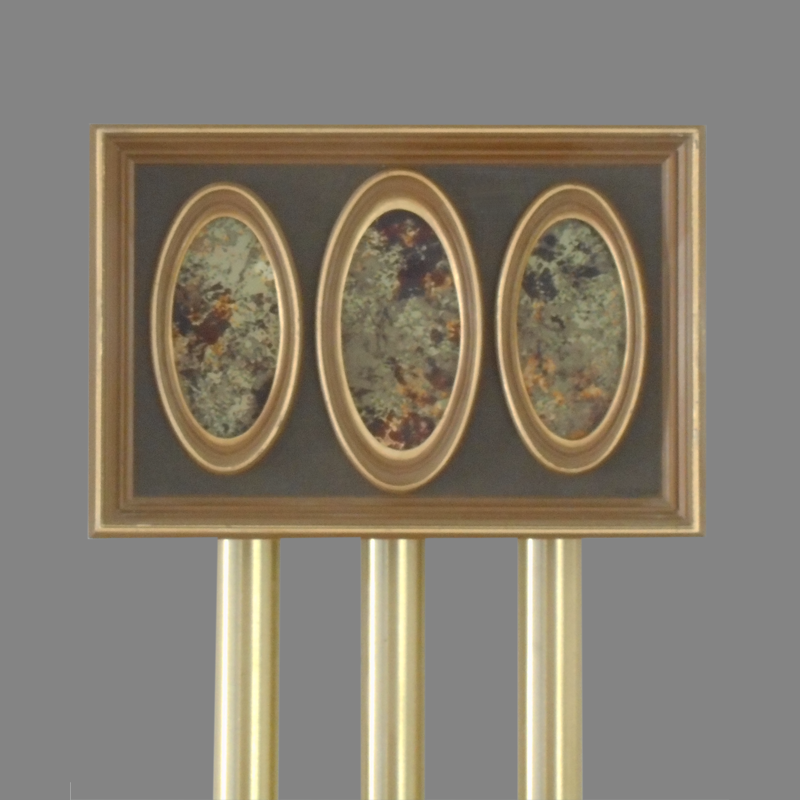 Gold-highlighted Ovals surround antique-mirror patterns in “Closine” Brown against cloth-textured background. Tubes are satin-finish brass. Sounds 2 notes for front door and 1 for rear or side door. The Heirloom inherited the L-34 Catalog number from earlier chimes. 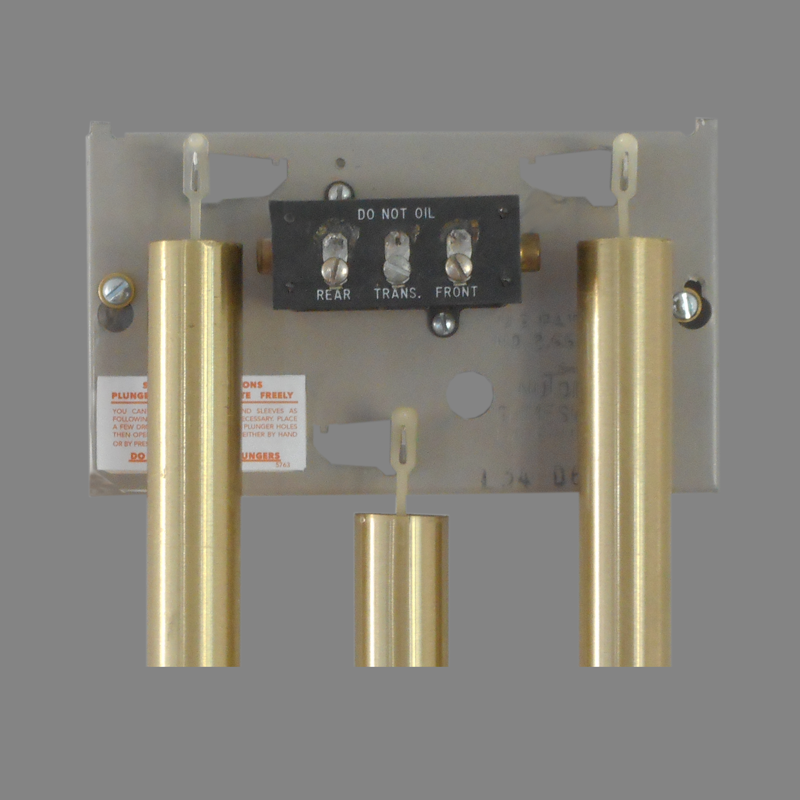 The mechanism employs the dual-acting solenoid mechanism and nylon bell hangers. Cover Styrene Plastic with antiqued glass mirrors and painted highlights. Looks for replacement part for the solenoid, in the picture above. 1970 Nu Tone L34 Heirloom Door Chime. Any for sale that work?? Hello, sorry for the tardy reply. Have you tried cleaning the unit per the instruction label? This often helps although these particular units are troublesome. If the cleaning does not work, please contact me at 415.259.4949 and we can discuss options for getting you going again. According to Nutone parts list for Nutone Model LA34, dual action solenoid is Nutone Part No D1849-00. Let me know if you find a source for this part. I do not think NuTone is manufacturing these units any longer although there may be some new, old stock lying about on some distributors shelves. We have a Nutone doorbell that looks identical to the picture. It came with the house we bought in 1991, likely bought by the earlier owners. It is labelled as “LB34”, or more completely “LB34H800”. The above discussion mentions “LA34”, so I’m guessing “LB34” is just a later model. We are also having trouble with it ringing and are wondering if it needs a stronger transformer. We have a 16V 30VA transformer. Does this doorbell need a higher voltage transformer? Additional history: When we bought the house in 1991, the doorbell would ring “Ding-Dong”. We tore down our house and rebuilt it in 2001, including putting back in this doorbell. After that, the doorbell would only ring “Ding” (i.e. no second note), and somewhat anemically. I’m only now suspecting that the original transformer was lost in the house demolition and replaced with a more modern, 16V 10VA transformer. Then a month ago, I put in a “Ring Video Doorbell Pro” (outside doorbell switch) and upgraded the transformer to a 16V 30VA model (NuTone C907). Now the doorbell doesn’t even go “Ding”. Hello David, I believe your transformer should be correct. I can’t say for sure without seeing a photo of your chime mechanism nor can I tell if the the LB34H800 is a later designation of the same chime. Please email me a photo, I’ve sent you a response by email. I suspect the Ring electronics may be causing the trouble, I’ve heard tell of this before. You can test for sure by removing the Ring doorbell pushbutton/camera unit and temporarily connecting a conventional doorbell button. The mechanism pictured on the L34 Heirloom example here in the Doorbell Museum uses the NuTone dual acting solenoid. These mechanisms can be troublesome so it should be cleaned. Have you cleaned the mechanism according to the instructions that should still be on your label? If the label is missing or illegible, you can find the instructions on this page of this site along with a description of your unit.